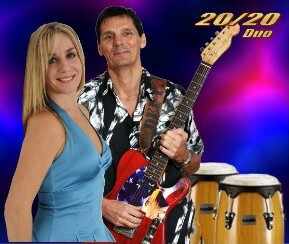 Hi we are 20/20 from the U.K. We have lots of experience and cover all styles of music from the 60s to present charts. We are available for long or short term hotel or cruise contracts anywhere in the world……….The Duo line up consists of Female Vocals and Guitar/Vocals and Percussion with bass and keyboard parts on tracks so there is a full Sound. We have a wide range of music including some guitar Instrumentals.